The Matrix E30 is On Sale! It is likely that you’ve heard of the Matrix Fitness brand. They are rapidly gaining popularity in commercial gyms across the nation. In fact, it’s the fastest growing commercial brand in the world. Usually products gain popularity for a good reason. With Matrix, that reason is smartly design machines, low maintenance, and great customer service from the parent company. The Matrix E30 is the introductory level model of Matrix ellipticals that have been specially designed for home use. Matrix Fitness comes from a parent company called Johnson Fitness. This is the same company that makes popular home brands Horizon and Vision. With the Matrix machines, you will see many of the same features like interchangeable consoles, interactive workout programs, and a workout tracking program called ViaFit. The Matrix E30 features suspension elliptical technology, a 20” stride, and a 23.1 lb. flywheel. 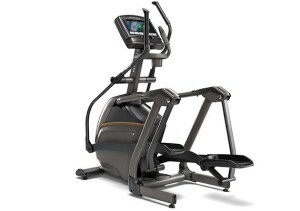 WEEKEND SALE ENDS MONDAY: The Matrix E30 Elliptical is on SALE! Choose from three different consoles to customize your machine’s technology. The Matrix E30-XR is typically priced around $2,099. The Matrix E30-XER is typically priced around $2,599 and the Matrix E30-XIR is usually around $3,099. We also suggest you check out the Life Fitness E1 for premium quality. Compact Footprint – The Matrix E30 is a suspension elliptical with a footprint of 57.5” x 29.5”. Some ellipticals are space hogs with lengths up to 80”. This smaller machine will fit much better into your home space. Suspension Elliptical Design – Since it does not have tracks and rollers, this suspension elliptical is going to be extremely quiet and smooth feeling. 20” Stride Length – The stride lengths on ellipticals can vary greatly, but a 20” stride length is well within the acceptable range. It will work well even for taller individuals. This size pattern provides a smooth and natural feeling gait. 9.1” Step-On Height – As opposed to rear drive ellipticals, a suspension elliptical tends to be much easier to step onto. This is especially nice for older users with more limited mobility. 23.1 lb. Flywheel – A heavier flywheel like this will help provide a smooth and natural motion. Some brands will go up to 30 lbs., so this isn’t the heaviest wheel on the market but it gets the job done nicely. 20 Resistance Levels – The resistance on this machine is provided by Eddy Current Brake (ECB) magnetic system. This type of braking is found on most of the top quality machines. Warranty – A long warranty is usually a good indicator of high quality on any piece of exercise equipment. The Matrix E30 comes with a lifetime warranty on the frame, 5 years parts, and 2 years labor. ViaFit – This workout tracking program allows users to wirelessly communicate workout data from their machine, popular fitness apps or by manual entry into a single online platform. 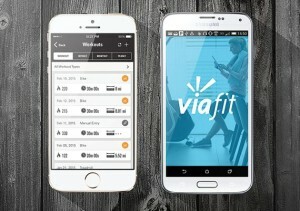 ViaFit is different from other elliptical brand tracking programs (like iFit or MyLiveLight). It takes data from all of your existing tracking apps and puts it into one location at no cost. In contrast, iFit Live requires a regular subscription. With ViaFit, you can track workouts, set goals, join online challenges, and link to your existing trackers like MapMyRun or FitBit. Sprint 8 – High Intensity Interval Training (HIIT) programs allow you to complete a short high intensity workout that lets you burn fat longer. With Sprint 8, an online coach and automatic interval speed adjustments will guide you through a workout for just 20 minutes a day, 3 times a week, for 8 weeks. This program has been scientifically shown to produce amazing results. Just know, it’s no joke! You’ll be seriously sweating by the end of each session. Virtual Active – Many elliptical brands have started incorporated virtual courses onto their elliptical consoles. With the Matrix E30, you will be able to work out on two courses loaded directly onto the machine. Additional courses can be purchased and uploaded via thumb drive. If you purchase the Passport Player, these courses can be displayed on your TV. The Virtual Active is available on the XER and XIR consoles. Passport connectivity is available on all three console options. 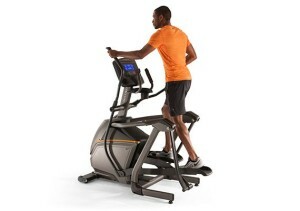 Johnson Fitness is one of the only companies to give you a choice of consoles with your new elliptical trainer. Matrix ellipticals come with three options: A basic screen called XR, an intermediate option called XER, and the ultimate in console tech with the XIR. Pricing and features vary between options so see below for a basic description of each. XR Console – This console is perfect for people who just want the basic stats clearly displayed on the 8.5” extra wide LCD screen. 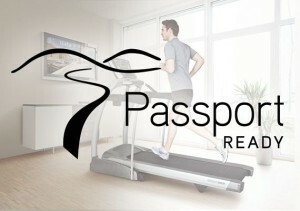 Five programs are included along with ViaFit connectivity and the ability to connect to a Passport Player for around $2,099. XER Console – The intermediate option comes with ten workout programs and an included Polar HR Strap for wireless heart rate monitoring. The screen is a 10” touchscreen enabled with Bluetooth technology, a USB port, Virtual Active, ViaFit, Passport Ready, and Console apps for Sprint 8, Media, Weather, YouTube, Netflix, Facebook, Twitter, Hulu, and a web browser. A Matrix E30-XER will cost around $500. XIR Console – If you want the ultimate in elliptical technology than the Matrix E30-XIR is available for $3,099. It includes a 16” HD touchscreen, Bluetooth capability, USB port, Virtual Active, ViaFit, Passport Ready, and all of the same console apps. Suspension ellipticals from Matrix are nice because they are very compact, comfortable to ride, and provide a smooth and natural feeling motion. This particular model is a good option for aging athletes who want an easy step-up while enjoying a smooth and quiet ride. The benefits of the E30 include the wide range of tech options and the choice of consoles. The only drawback on this model is that it does not have incline capability. If you want to vary the incline, you will need to look at the larger ascent trainers from Matrix, the A30 and A50. Look at the Matrix E50 if you are interested in a more advanced resistance system, more resistance levels, multi-grip handlebars, premium cushioned pedals and an upgraded warranty.